Have you ever wished for any tool that can record the actual problems you are facing while operating the Windows Operating System. You know what, your wish has came true. There is an inbuilt tool in Windows to perform all these doings, named as Problem Steps Recorder. Here, we are not referring any key-logger or hack tool, we are just showcasing this neat, clean, and inbuilt Windows capturing tool which may help you in the case of any problem. This hidden diamond, inside the Windows, can record each and every step related to the problem, and will help you to demonstrate the same to others. Normally, when we need any help from the others, we actually fails to explain the real problem to them, in return will never get any perfect solution for the problem. 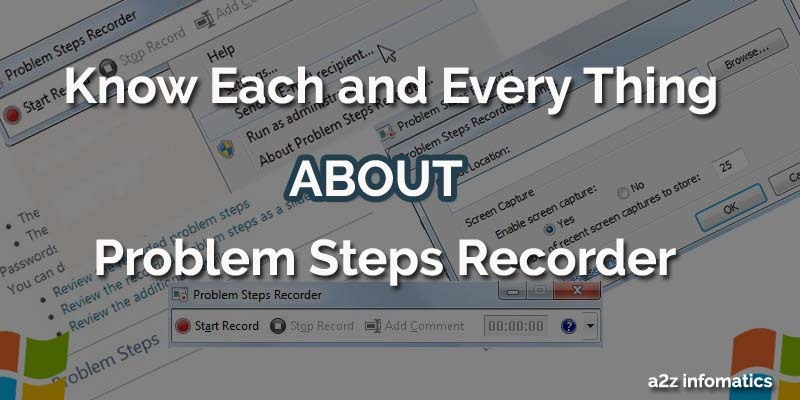 This inbuilt Windows tool (Problem Steps Recorder) is the perfect solution for the problem, you can just open it, record the steps, send it to others, and get the help / solution within minutes. For easy understanding about Problem Steps Recorder, Suppose while installing any particular SOFTWARE in Windows, you are facing many different problems. Now, while asking for the help from others, What will you explain to them about this problem ?, they may ask you explain the problem in detail 🙂 . Now using this “Problem Steps Recorder” tool, you can just follow the doings to install that particular SOFTWARE again, and it will record every single instance with the screenshots to a file. The best thing about this tool is, it saves every thing in sequence. Just send this generated file to anybody using email or whatever medium, and get the help within minutes. We hope, this now has been much much clearer to everybody. In addition to the above benefits, it has some more uses to its name too. You can use this “Problem Steps Recorder” tool while doing any payments related activities, like saving the invoice, payment amount, payment medium used, merchant address etc etc, it will save the complete record for the transaction for any future need. Believe or not, we also had seen many work-shy bloggers using this tool to generate How-to Tutorials for their blog posts, no no we never did, using this method 🙂 . We hope, everybody has now understood the importance to use this tool in our routine activities. Let’s move to the next section, How to actually use this inbuilt tool, Problem Steps Recorder. Below are the easy steps to open / use “Problem Steps Recorder”. 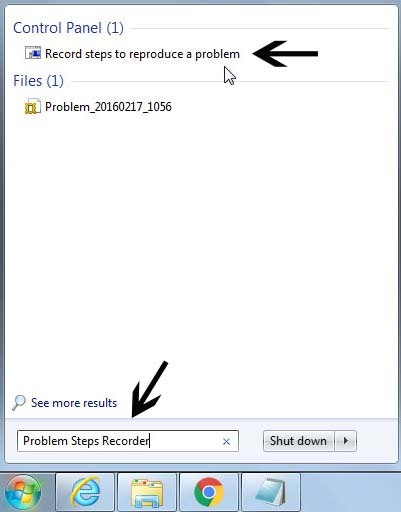 1)- Go to the Start Menu and search for “Problem Steps Recorder” in the search box there. 2)- Now, Click>Open “Record steps to reproduce a problem” under the results. 3)- As you can see, a new Window named “Problem Steps Recorder” has opened for you. 4)- Now, you just have to click the “RECORD” button and go through with the same process again, the process where you found the problem. Once that process is finished, click the “Stop Record” button and this tool will ask you to supply any “file name” and the “location” to save the related file. 5)- Now, check the preferred location, there will be a zip with the same name you have supplied above. This zip file contains a “.mht” file, which contains all recorded data. Just open this .mht file to confirm the saved results. For easy understandings, Suppose you are having problem with the Mp4 files, they aren’t opening. In this case, just open “Problem Steps Recorder”, Click “Start Record” and move to the process (opening Mp4 file). Once you got the error message with the process, select “Problem Steps Recorder” from the task bar and HIT “Stop Record”. Now, supply any desired file name to it and save it to any desired location. Now, send the generated zip file to any of the friend or professional, from where the help is expected. Don’t you think, this is DAMN easy 🙂 . Important: You don’t have to worry about the “.mht” file, actually mht is one of the Web-Page archive file format, and it will open in the default web browser. (Mainly Internet Explorer). Congo!, You have successfully created the detailed record file for the problem. You can now send it to anybody, if seeking any help, you don’t even have to say any single word related to the problem. This recorded file will speak itself 🙂 . Although there are very few number of features available for this tool, whatever available, all are important and will leave great impact to the generated file for the problems. Below, we have listed all its features in detail. 1)- Add Comment: For Privacy reason, While the recording is ON, this tool will never insert any of your TYPED data to the report. Actually this is a good thing in this tool as it may contain, passwords, bank account information, credit card number etc etc. But, what if we need to include any TYPED data to the final report. Don’t worry, this “Add Comment” option is for the same. While recording any action, just click this “Add Comment” button, Type the text in the BOX, select the location of this Comment Box to appear, Hit Ok, and that’s it. Now, everything typed in this “Comment Box” will be available in the final generated report of this “Problem Steps Recorder” tool. While recording the actions, you can use this “Comment Box” as many times as you wish, and in between any of the instance. 2)- Send to E-mail Recipient: This feature is to send the recorded file to other people from here itself, just make sure that the file has been saved to the hard disk, prior to using this feature. This will use the default email client of your system to send the E-mail message, you don’t even have to attach the recorded file manually. Don’t you think, this is a cool feature for making the process simple. 3)- Adjusting the Settings: To open the Settings Menu, check the picture above. a)- Output Location: Here you can pre define the storage location for the recorded files. b)- Enable screen capture: In this option, Select YES, if you want to include the screenshots in the final report. Select NO, if you don’t want the screenshots to be included in the final generated report. Isn’t that’s very easy to understand 🙂 . 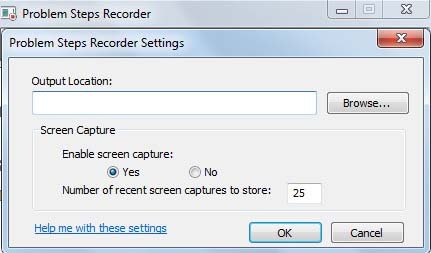 c)- Number of recent screen captures to store: Here, we can select the number of screenshots to be used for any single recording. You can update the default number of 25 to any number, according to your needs. Important: The changes made to these settings is never permanent, it’s only for the active / current session. You have to adjust these setting manually, each and every time, prior to record any report OR just record using the default values. 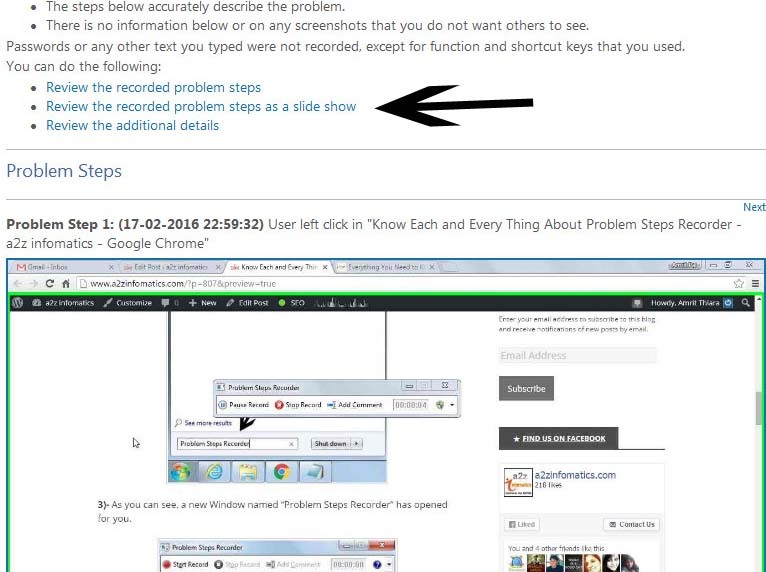 How to view the REPORT generated by Problem Steps Recorder. 1)- Go to the location, where you have saved the zipped file from the recorder. Unzip that to any desired location. 2)- Check the unzipped folder, look for the .mht file, Just open it. 3)- Now, you will be with 3 options, which are explained below. Review the recorded problem steps: This is for the basic preview of the generated report, You can find every information related to the problem in a single page. Review the recorded problem steps as a slide show: This option is to view the report in slide show, same as Power Point slide shows. Review the additional details: This section is for the advance user, who need to have system related information to resole the issue / problem. Note: This “Problem Steps Recorder” tool is available in Win 7 and all other later versions of Windows. Believe us, the existence of this recording tool is still a hidden for the majority of the population, not for you. While sharing all we know about this tool, there maybe some errors, please inform us the same using the comments section below. That’s it for now, We will surely be back with many more informative blogs, same like this one. Please keep supporting us. Thanks for your visit, keep visiting a2z infomatics. God Bless Everybody.